Though Gotham is full of visiting heads of government and state, the President is meeting no one this time around. Is it insurance against possible gaffes? Or just a broader excuse not to meet the Prime Minister of Israel? On Monday, President Barack Obama made his fourth pilgrimage to New York City for the opening of the United Nations General Assembly. He arrived in Manhattan on a glorious autumn afternoon and rushed to his first – and only – public event of the day: a taping of ABC’s The View with his wife, Michelle. Of course, meeting with world leaders when you don’t know if you’ll still have your job in the next few weeks, can be potentially awkward. It can lead to unfortunate hot-mic gaffes, of which Obama has not been immune (for example, in Seoul earlier this year he asked Russian President Dmitry Medvedev to be flexible on missile defense until after the election, when Obama would have more space to maneuver–too much diplomatic candor for the sensitive electoral season). Still, ignoring the opportunity to meet one-on-one with world leaders underlined where Obama’s attention is fixed: the campaign. 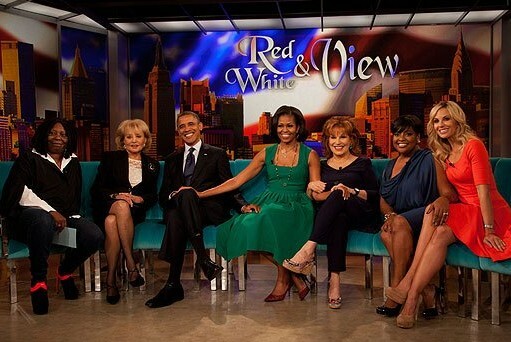 And it was the election that dominated the taping of The View. That, and the inside skinny of the Obama family’s schedule. Jay Newton-Small’s aritcle was originally published in Time on Sept. 24, 2012.